From the motorway A10 (Berliner Ring) take the exit Königs Wusterhausen 5 km east of the motorway junction Schönefelder Kreuz. Follow the direction to Wildau. Take a right into Bergstraße, on the next roundabout exit in the direction of Zeuthen. From Lindenallee turn right into Platanenallee. The distance is about 7 km from the exit to the institute. From station Berlin Hauptbahnhof and Ostbahnhof: Take the S5, S7, S75 to Ostkreuz. Change here to S9 (direction Schönefeld) or S8/ 85 (direction Grünau) to Adlershof. Change again to the S46 (direction Königs Wusterhausen). During rush hour you can take the S8 directly to Zeuthen; about 60 minutes from Berlin Hauptbahnhof, about 50 minutes from Berlin Ostbahnhof. Please use the Journey planner of the Berliner Verkehrsbetriebe. Exit the station in the direction of Königs Wusterhausen. At the rail-crossing, take a left. After 50 metres take a right into the Lindenallee. Follow the street and take a left on Platanenallee (third cross-road). Follow the street for 50 metres. 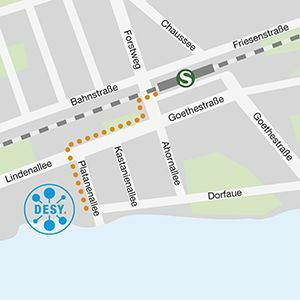 DESY is located on the right.